The Bears hockey team recorded consecutive wins for the first time in over a month this past weekend, defeating the Calgary Dinos 6-1 on Friday and 1-0 on Saturday night. Friday night’s game was tight at the start, as the Bears were only up 1-0 after the first period, but they were able to break it open early in the second period. Riley Keiser slid a pass from behind the net into the slot to fifth-year forward Jordan Hickmott, who made no mistake, giving his team a 2-0 lead. The Bears were then able to press home their advantage just 50 seconds afterwards, as Brett Ferguson capitalized on a goal front scramble, giving his team a 3-0 lead. 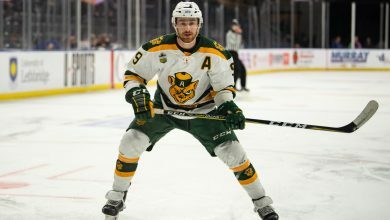 Stephane Legualt, Will Tomchuk, and Levko Koper added goals for the Bears afterwards, while the Dinos were only able to respond with a single goal of their own, making the final 6-1. Head coach Serge Lajoie said those quick goals in the second period really helped his team’s mindset in the first game. “I think there was collective sigh of relief, because in our last four or five games we hadn’t been rewarded for how hard we worked, and how many chances we had created,” Lajoie said. The Dinos made sure there was no 6-1 blowout in the second game, holding the Bears scoreless throughout regulation, and killing off all five of their penalties. 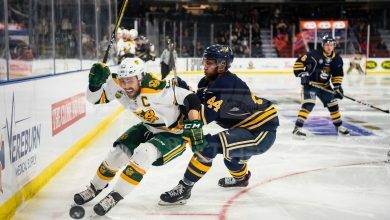 The Bears were finally able to break through within the first two minutes of the overtime however, as Thomas Carr was able to deflect a point shot past Dinos goaltender Steven Sanford, giving the Bears the two game sweep. Stanford was excellent in the second game, stopping 32 of 33 shots, denying Levko Koper on a breakaway in the third period to keep the game scoreless. Lajoie said that his team was able to stick with the game plan in the second game, despite not being able to capitalize on their chances. Bears goalie Luke Siemens was excellent on the weekend, stopping 52 of 53 shots he faced over the course of the two games. This is the first time the Bears have won consecutive games since a weekend sweep of the Regina Rams on Oct. 15 and 16, and Lajoie said these wins against the Dinos came at the right time to give his team confidence moving forward. “It’s validation for us that we’re heading in the right direction,” Lajoie said. 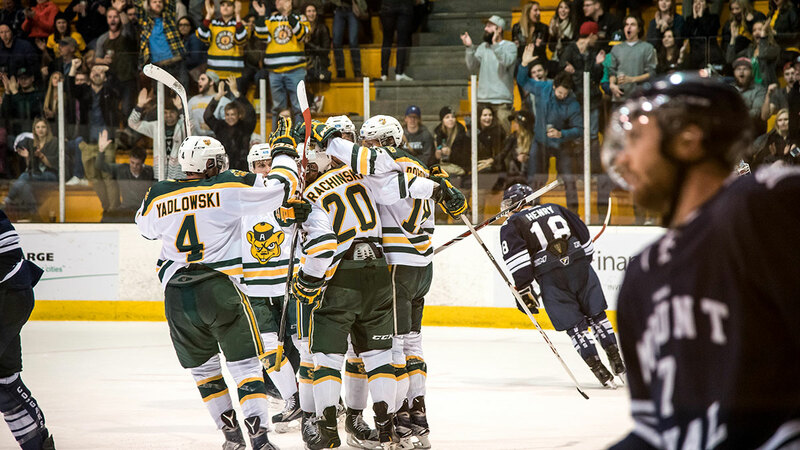 The Bears will look to take this momentum into their upcoming matchup with the UBC Thunderbirds, who are currently tied with the green and gold for second place in Canada West. Lajoie said his team is looking forward to the matchup. The Bears now sit three points clear of the Mount Royal Cougars, and four points up on the Lethbrdge Pronghorns, and have posted an impressive 7-3 record in their last ten games. Conversely, the Thunderbirds have been trending in the opposite direction of late, salvaging the final game of their weekend series against the first place Saskatchewan Huskies to snap a three-game losing streak. Both teams sit three points behind the Huskies in the standings, and will look to make up ground this weekend. The Bears have not met their west coast rivals this year, but posted a 3-1 record against them last year, including a series sweep last Nov. 14 and 15 that bookended a 12 game winning streak for the green and gold. The Bears outscored the Thunderbirds 15-8 in their four matchups during conference play last year. The Thunderbirds will look to ride their goalie-by-comittee strategy to success this weekend. Matt Hewitt and Eric Williams have both played six games this season, and have posted goals against averages of 2.14 and 2.43 respectively, good for second and third in Canada West. The Dinos meanwhile, now have lost three straight games, and sit second to last in the Canada West standings. They will look to right the ship next weekend against their cross town rivals the Mount Royal Cougars. The Bears will take on the Thunderbirds on Friday, Nov. 20, and Saturday Nov. 21.